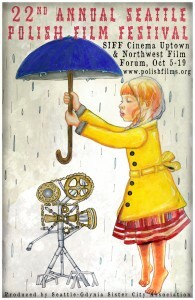 I love September….it’s a sure sign that the Seattle Polish Film Festival is close at hand. Join us at our monthly Seattle Gdynia Sister City meeting (Friday, September 12 at Polish Cultural Center, Seattle). We’ll spill the beans on what’s happening at the 22nd Annual Seattle Polish Film Festival coming up October 5-19, 2014!